Here's a little something I dreamed up one night, based upon the Lord's Prayer. Unless you've done your share of Intel assembler programming, some of it won't make much sense. I can't take credit for this, but wish I could! Now I'm stuck with non-deterministic finalization, and I know why. Because I got high, because I got high, because I got high. This was originally entitled "A Day In the Life Of the Image Activator" I got it from some ex-DEC'ies, and found it to be one of the funniest things I've ever read. I've translated it as faithfully as I could to Win32 terminology for the benefit of non-old timers. Comments are of course welcome. It's long, so I've placed it on its own page. Click here. I used to work for a major corporation. One of the joys of this job was filling out the monthly time sheet. Yes, even salaried employees had to do this. 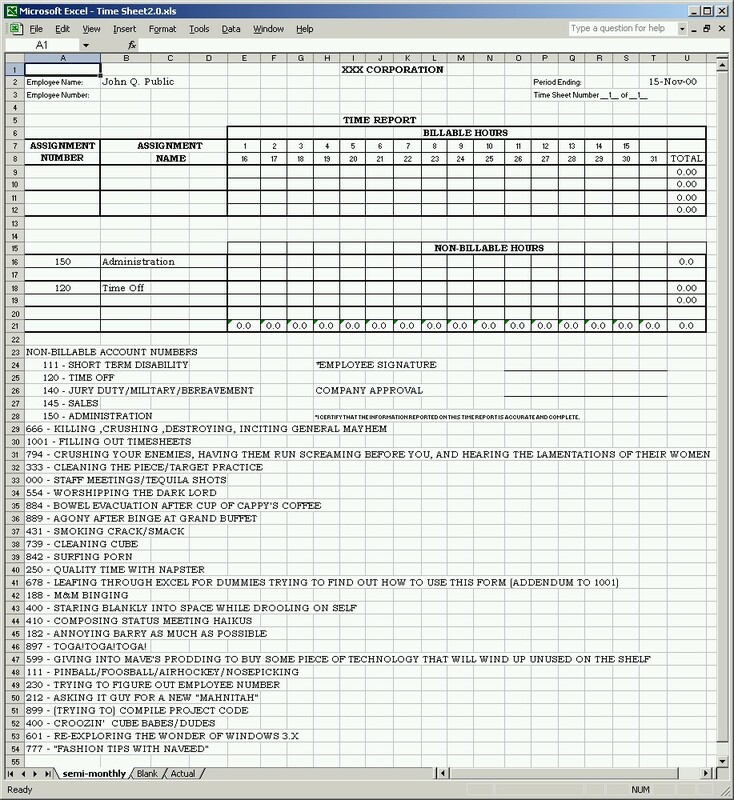 Here's a sample time sheet, with a few minor additions to make it easier to fill out. I can't take credit for doing this, but the guilty parties know who they are. 4. Appointing an inter-departmental committee to study the horse. 5. Arranging to visit other countries to see how they ride dead horses. 8. Creating another inter-departmental committee to increase our riding ability. 10. Changing the requirements to declare that "This horse is not dead." 11. Hiring contractors to ride the dead horse. 15. Hiring a consultant to see if contractors can ride it cheaper. 16. Purchasing a product that makes dead horses run faster. 18. Forming yet another inter-departmental committee to find alternative uses for dead horses. 19. Revisiting performance requirements for horses. 20. Saying this horse was procured with cost as an independent variable. 21. Promoting the dead horse to a supervisory position. "We can't do this proposed project. **CANNOT**. It will involve a major design change and no one in our team knows the design of this legacy system. And above that, nobody in our company knows the language in which this application has been written. So even if somebody wants to work on it, they can't. If you ask my personal opinion, the company should never take these type of projects." "This project will involve a design change. Currently, we don't have any staff with experience in this type of work. Also, the language is unfamiliar to us, so we will have to arrange for some training if we take this project. In my personal opinion, we are not ready to take on a project of this nature." "This project involves a design change in the system and we don't have much experience in that area. Also, not many people in our company are appropriately trained for it. In my personal opinion, we might be able to do the project but we would need more time than usual to complete it." "This project involves design re-engineering. We have some people who have worked in this area and others who know the implementation language. So they can train other people. In my personal opinion we should take this project, but with caution." "This project will demonstrate to the industry our capabilities in remodeling the design of a complete legacy system. We have all the necessary skills and people to execute this project successfully. Some people have already given in-house training in this area to other staff members. In my personal opinion, we should not let this project slip by us under any circumstances."